While outdoor water use can account for as much a 50% of water consumed by households during the summer, there are easy ways to slow the flow. You can reduce your outdoor water consumption by taking a few simple steps. So tighten those taps, eliminate those leaks and water your lawn wisely. Watering Tips and Resources from Eco Green For Lawns and TreesThere has long been the misconception that lawns, mainly Kentucky bluegrass, require large amounts of water. This causes lawns to be over watered. This is completely wrong; in fact, most turf grasses will survive on less water if managed properly. For an established lawn you should use infrequent and deep watering to encourage the roots to develop deeper into the soil. Watering too frequently results in shallow roots, increased susceptibility to drought and disease. Underground Sprinklers are a great way to conserve water. Underground sprinklers are one of the best ways to conserve water. Sprinkler systems make it easy to water early in the morning when there is minimal evaporation and tend to keep the watering directed to the lawn without spraying onto the street or other unwanted areas. But they can also cause us to water too frequently and shallower than when we had to drag hose. Set your watering schedule to water deeply a couple times each week rather the daily light watering. It’s always best to monitor the soil moisture levels and only water when needed. Try using a soil probe to evaluate or when you walk across the grass and the blades don’t spring back up, leaving footprints, it’s time for a deeper irrigation. Make sure that when you are deep watering, not to cause runoff, as this can be wasteful and costly as well. When Mother Nature provides water, you can stop watering for a period of time depending on the amount of rain as well. Evapotranspiration is one of the main reasons for water loss. Another way that water is lost is evapotranspiration (ET). This is the combined water lost due to evaporation and transpiration of the grass. Transpiration is how plants breathe and is a natural part of life in plants. They must release water to survive and hot and windy weather can speed this up considerably. Evaporation loss can be 60 percent higher during the day, so water during the cool, early morning hours to minimize water loss by evaporation and to discourage disease. Avoid watering on windy days. What are the best times to water? To reduce losses to ET, don’t water between 10 AM and 6 PM. Some cities carry water restrictions during this period anyway, and for good reason. The ET is highest during this period of the day. Watering during windy periods is also very wasteful. The best time to water is from about 5 AM to 9 AM. ET is lowest at this time and watering in the late evening is not preferred because it can promote turf diseases. You may hear that the evening is a good time to water, but it’s a misconception. When you water in the evening it is cool, but the moisture tends to sit on the grass blades all night long, creating the perfect environment for diseases to grow. 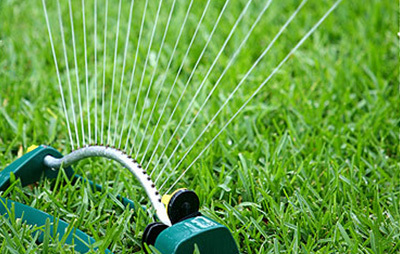 By watering early in the morning, you are getting the benefit of watering during a low ET period and saving water. It also does not promote a favourable environment for diseases, because soon after you are done watering, the sun comes out and the grass blades dry off while leaving the soil moist.